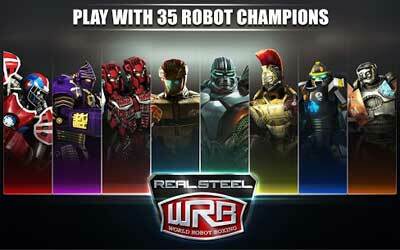 Based on a movie Real Steel World Robot Boxing APK 25.25.714 can make you go rampage. It is a fighting game for your Android device. It is similar to many famous fighting games, where you control the robots from the movie. This game is a continuation from the previous one in a similar fashion. The game will bring you to a fight against over twenty different robots and you can play it with online friends or against computer. Furthermore, there’s more than a simple fighting element in this game. In addition, you are given few game modes: Championship, time fight, daily display, and free sparring. With an already large array of gameplay, there’s also a support for social modes. Through Wi-Fi, you can battle your friends in a local multiplayer mode. The battle mechanism itself is easy but fun. There are three buttons you can push to perform different kind of actions: Strong hit, weak hit, and defend. Some combinations of buttons allow you to unleash different combos and you can use them at your disposal to take down the enemy quicker. However, the fun doesn’t stop there, because there are still more features which takes the fun even higher. You can choose various robots which you can use and tweak. With 24 chrome fighters from the movie, eight new chrome fighters are provided for you to use. But there’s more than merely choosing the suitable robots because you can also improve your robots. Fully customizing your robot is now more possible and enables you to build a robot which suits your fighting style. With more and more improvement from the previous game, Real Steel World Robot Boxing for Android is fun to play and satisfying your desire for fighting through your Android device. Unleash Superbot Power with ANUBIS – The Golden Jackal.